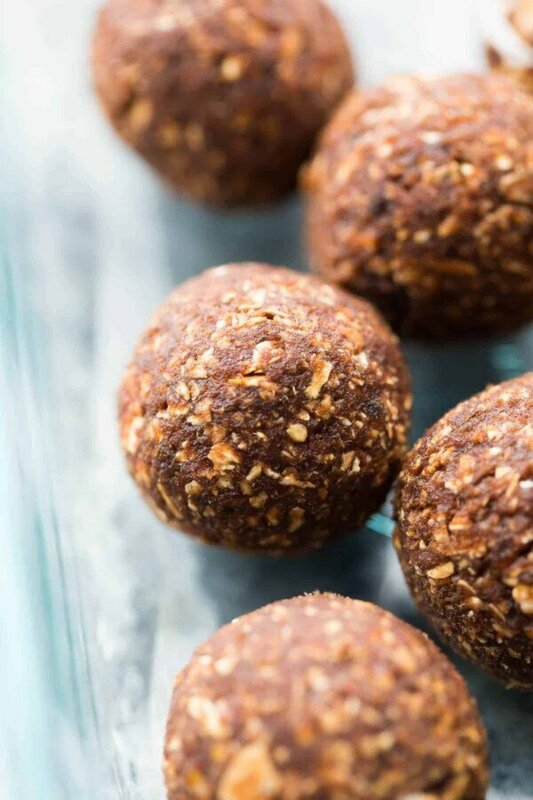 These nut free energy bites can also be made seed-free and coconut-free, perfect for those with allergies, as well as teachers and kids from nut-free schools. I have to admit, sometimes I feel a little behind on the times when it comes to newer rules and regulations in schools. My kiddo is four (sob! How is he already FOUR?! ), and is now attending pre-school. Next year will be the big jump to kindergarten and I’m sure I have a lot to learn. 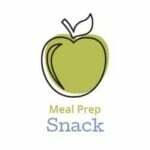 I hadn’t realized how many schools are nut-free, until I had many Lunch Prep Challenge participants ask me for nut free alternatives to my No Bake Energy Bites 7 Ways. And I was surprised at how challenging it is to find nut free energy bite recipes! 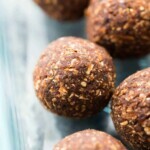 So today I’m excited to share with you my nut free energy bites, a few different ways. 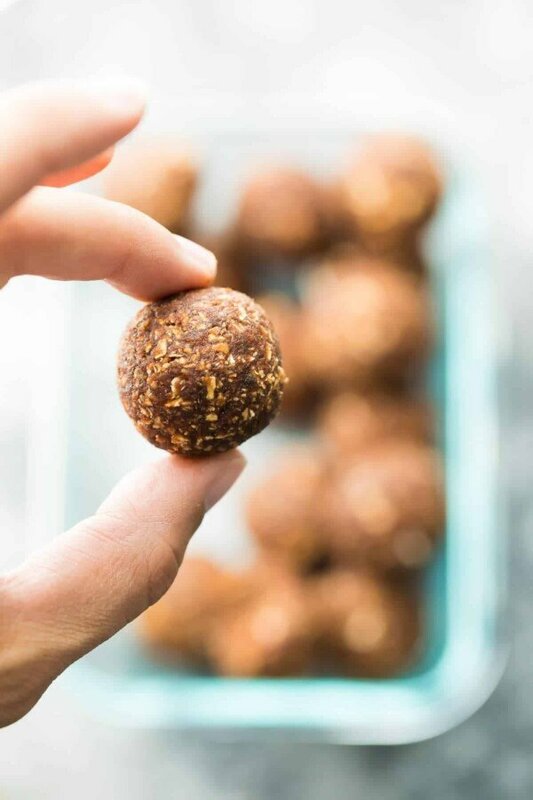 The base version of these nut free energy bites is super duper simple, and has just four ingredients: medjool dates, maple syrup, cocoa powder and rolled oats. I soaked my dates in boiling water for 10 minutes to get them nice and moist before blending everything together. The resulting energy bites are chocolatey, sweet, and delicious. I recommend that you use this base recipe to get creative and toss in 1/4-1/2 cup of add-ins! Even though the 4-ingredient version of these nut free energy bites were darn good, I was missing a little texture that you get by adding nuts. So for round 2 of these energy bites, I added a bit of shredded coconut into the food processor, then rolled them in a bit more. I know that some people who are sensitive to nuts are also sensitive to coconut, so if you are, then stick to the base recipe. But if you can tolerate coconut, then I say definitely go for this version! 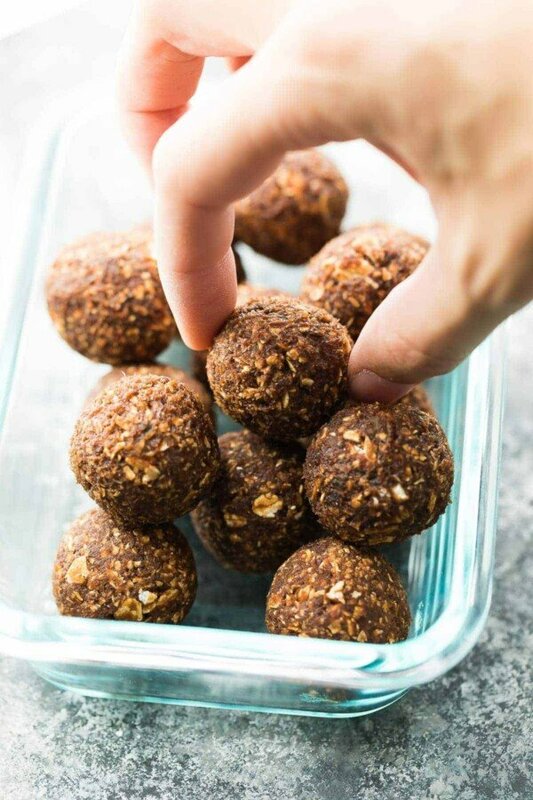 These coconut energy bites are seriously amazing. You get a bit more texture in the energy bites from the shredded coconut, and another dimension of flavor. Ben says they taste just like a lammington, which is an Aussie coconut-chocolate treat. And for our third version, I was craving pumpkin…so I made these nut-free pumpkin energy bites. I added some pumpkin seeds to the food processor, which helps give these energy bites a bit more texture, and also tossed in some chocolate chips towards the end. They absolutely make these energy bites! Highly recommend them. Again, some people still have seed intolerances, in which case, stick to the original (base) recipe. 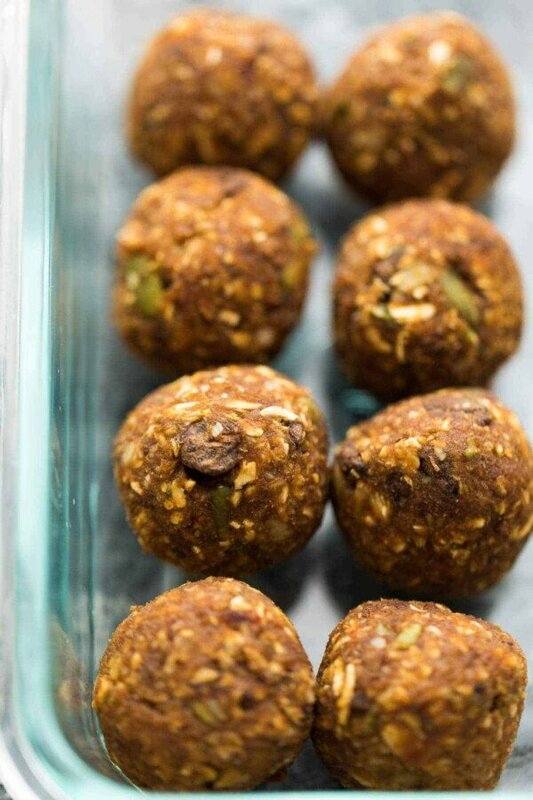 But if you can tolerate seeds, these nut-free pumpkin energy bites are a great alternative! In a large bowl, cover the dates with 2 cups of boiling water and allow to sit for 10 minutes. Remove dates from water, shaking off excess, and place in a food processor fitted with a steel blade. To the food processor add 2 tablespoons of the water along with the maple syrup, cocoa powder, and 1 cup of rolled oats. Process until smooth, scraping down sides. If mixture doesn't process, add water 1 tablespoon at a time until it does. Add the remaining ½ cup of rolled oats and pulse until it's mixed in. Put the food processor in the fridge for at least 10 minutes before rolling into 1 tablespoon sized balls. In a large bowl, cover the dates with 2 cups of boiling water and allow to sit for 10 minutes. Remove dates from water, shaking off excess, and place in a food processor fitted with a steel blade. To the food processor add the maple syrup, cocoa powder, 1 cup of rolled oats, and ½ cup of shredded coconut. Process until smooth. If mixture doesn't process, add water 1 tablespoon at a time until it does. Scrape down sides and add the remaining ½ cup of rolled oats. Pulse several times until mixed in. Place food processor into the fridge and chill the mixture for at least 10 minutes. 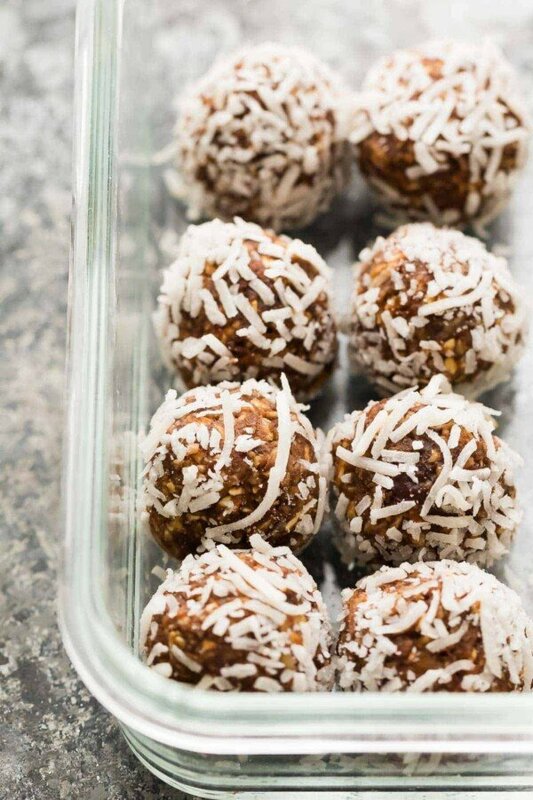 Roll into 1 tablespoon sized balls, and toss to coat in remaining ¼ cup of shredded coconut. To the food processor add pumpkin puree, maple syrup, 1.5 cups of rolled oats, ¼ cup of pumpkin seeds, cinnamon, nutmeg and cloves. Process until smooth, scraping down sides. If mixture does not process, add in water 1 tablespoon at a time until it gets going. Add the remaining ½ cup of rolled oats, ¼ cup pumpkin seeds, and the chocolate chips. Pulse 5-10 times until mixed in evenly. Place food processor in the fridge for at least 10 minutes to chill. 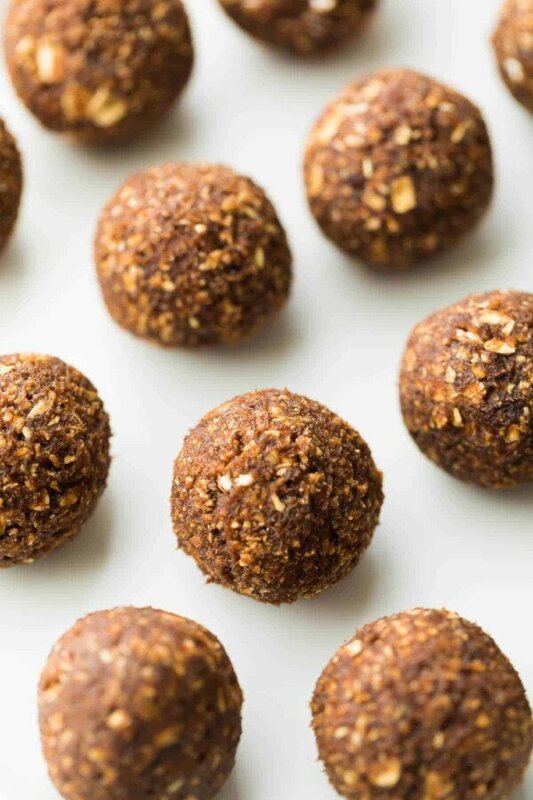 Roll into 1 tablespoon sized balls. Is there an alternative to the dates, by any chance, that would do the trick? I love your site! Thank you for all the work that you do. It has made my efforts to prepare healthier options for my family soooooo much easier! Having your easy, nutritious, no-excuses lunch meal prep recipes has had a very positive effect on my time, wallet, and waistline. I’ve been making a batch (or two!) of your other energy bites each week for a while now. Even though we don’t have any nut allergies at my house, I’m eager to try these to experiment with using dates. The idea of adding peppermint extract has my mouth watering! THANK YOU! Pinterest is teaming with energy bite recipes & I haven’t been able to make them because my family is allergic to nuts. I will definitely try these. I just found your blog & I’ve been binge reading and pinning like crazy. This is such a well thought out site. I love that I can jump down to the recipe, see if it’s something I’d like to try, and then go back and read. The “Adjust Servings” button is awesome. I can easily pin & print. Aaaand you give the nutrition facts too! I wish more food blogs were as user-friendly as yours!